DC Universe Animated Original Movies: BATMAN - THE KILLING JOKE Review | Warped Factor - Words in the Key of Geek. Matthew Kresal's heard the joke before. 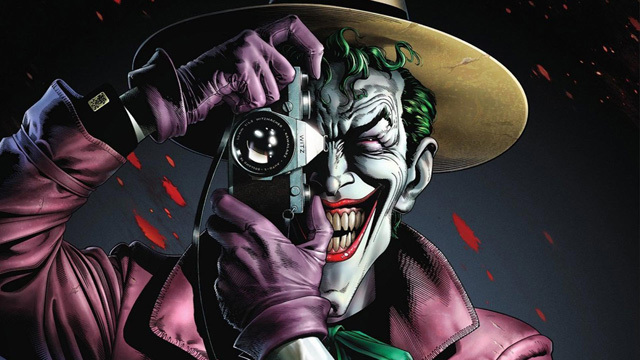 The Killing Joke (that is the graphic novel written by Alan Moore and illustrated by Brian Bolland) is considered one of the definitive Batman/Joker stories ever told. It's also a controversial one to be sure, with what Moore chose to do to one of its supporting characters. So when it was announced that it was, at last, receiving a screen adaptation, fans couldn't help but be excited. Then, when the news came that one of the definitive Batman/Joker performance teams (Kevin Conroy and Mark Hamill) were playing those roles, it was even harder to not be excited. So much so that despite being slated to go straight to DVD, it received a successful yet brief cinema run as well. Was it to prove to be as successful as its original comic counterpart? Let's look at the 'no' side of the equation first, shall we? The problem is the film's opening half hour which focuses heavily on Batgirl, aka Barbara Gordon (voiced by Tara Strong). Instead of feeling a natural extension of the original Alan Moore tale (which takes up some forty five minutes of screen time), it instead ends up feeling tacked on like the longest ever James Bond style pre-credit sequence. Worse, it has not a single connection to the actual plot and does nothing to really develop the characters it involves except in trivial ways. The perfect example being a rooftop confrontation between Batman and Batgirl that ends up with a legitimate "what was the writer thinking?!" moment. That said, it's not bad and wouldn't have necessarily been a bad short film on its own, but glued into Killing Joke, it pales by comparison. Once we get beyond that opening half hour and into actually doing what the film sets out to do, it works and works bloody well. Writer Brian Azzarello turns the original Moore (who for his own reasons has been uncredited on a number of works adapted from him for years now) into a full functioning script laying out the narratives of the Joker wounding Batgirl, trying to drive Gordon insane, and confront the Batman, while also looking at the day that made the Joker into the man he is. It's also played out just as Moore wrote it and Bolland illustrated it in all of its unsettling glory. All of which is anchored by the ever excellent DC animated production values. The voice acting is everything you would hope for it to be from Conroy's Batman to what might very well be Mark Hamill's best performance as the Joker. Whatever else one cay say about the film, Hamill shines as one of the definitive Joker performers gets to bring to life perhaps the definitive tale of the character. Hamill does this wonderfully from one line to the next, showing the tragedy that comes to underline the character. The supporting cast does well too, even those in the first half hour do as well as might be expected with the material they're handed, including Ray Wise as Commissioner Gordon, Strong's Batgirl, and Robin Atkin Downes as Detective Harvey Bullock. It's a solid cast to say the least. The animation is also solid. While it never quite manages to catch the same realistic and neo-noir tones of Bolland's illustrations, it does presents something that is a close match for it. Even better for comic fans, the film recreates some of the iconic panels from the original comic splendidly. For the most part, the DC animated films have had good animation and this one is no exception to that rule. In a way though, despite what The Killing Joke does successfully, it feels like it doesn't quite live up to expectations. In large part, that comes down to the underwhelming opening half hour which stands in stark contrast with just how good the remainder of the film is. In a sense then, it's a a shame they stuck that prologue onto it because this might have been among the best comic screen adaptations otherwise. What it is instead is nearly 2/3 of one and 1/3 of something that's watchable but not as good as it ought to have been.